Connect ethernet cable and power cable to UWB Sniffer as it is depicted in picture below. In this section we are going to adjust TCP/IP settings at PC host in order to be able to communicate with the UWB Sniffer device. Host’s IP address must be within the same network scope as the UWB Sniffer device. Set host IP to 10.10.10.1 and network mask to 255.255.255.0. This can be done via “Network and Sharing Center” in Windows. Press CTRL+R and type “ncpa.cpl” Enter. Then you need to select network interface, where you have attached the sniffer and set IP and network address. Now, point a browser to sniffer’s home address http://10.10.10.2, homepage should appear. UWB Sniffer acts as a probe which capturing 802.15.4 frames and forwards them to a remote host computer. In order to be able to work with those frames Wireshark software is used. Download, install and run Wireshark. Please select the Wireshark 1.12.x branch for your operating system and architecture. 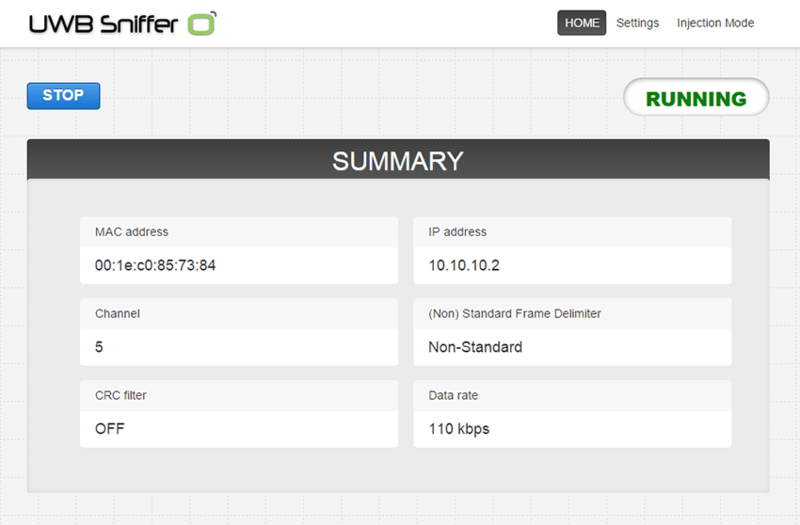 Select the ethernet interface (linked to UWB Sniffer) from the available capture interfaces and start capturing frames. 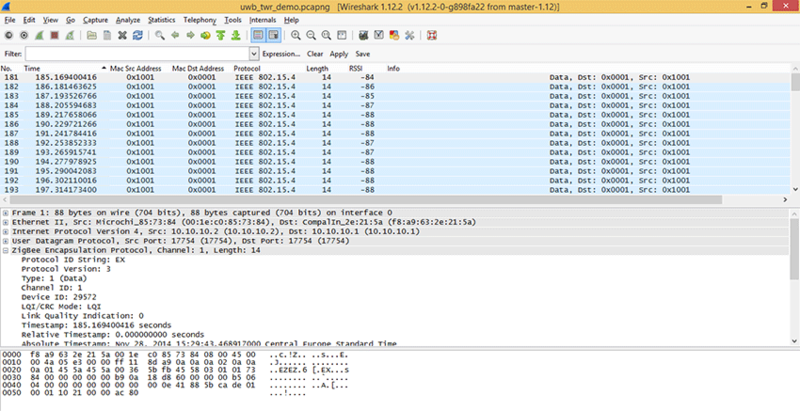 Wireshark implicitly shows all frames from wired and wireless networks delivered to the selected interface. 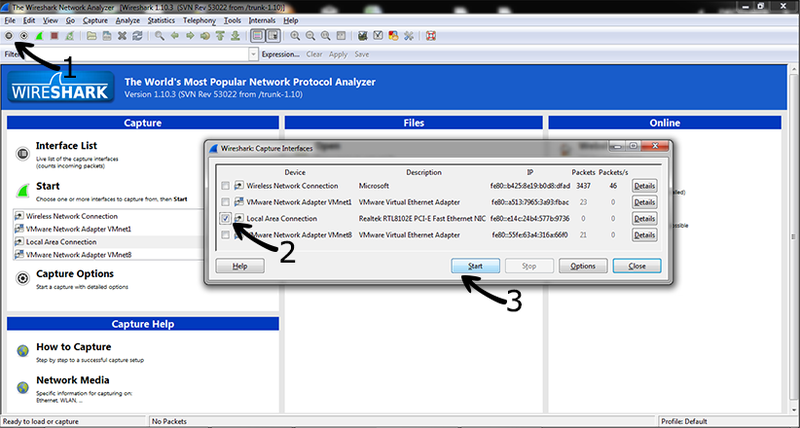 Therefore, it is useful to apply 802.15.4 filter which is referred as “wpan”. Now the host side is ready and you need to start UWB Sniffer via web interface. Point the browser to sniffer’s IP address and press RUN. How to change sniffer’s channel and other params can be found here. Sniff your own UWB hardware or download our captured file. In the part two you have ended with some data captured and delivered to Wirehark. You may download the sample file uwb_twr_demo. Wireshark has default columns settings for wired Ethernet network, see picture below. Time Ethernet timestamp of the frame assigned by the operating system. This is NOT precise timestamp from UWB Sniffer. From the table above it is obvious the default column settings are not associated with 802.15.4. Therefore, user can adjust them to the 802.15.4 frame info. Let’s refresh the encapsulation scheme for each 802.15.4 frame delivered to the host (see picture below). While the grey colored protocols are used only to transport the 802.15.4 frame through a network infrastructure, the ZEP – Zigbee Encapsulated Protocol carries all the important information such as sequence number, timestamp or channel number related to the every 802.15.4 captured by the UWB Sniffer device. Although, Wireshark natively contains ZEP protocol v2, we have developed ZEPv3 which is backwards compatible. It brings additional information related to band, channel page and precise timestamp information. In case that additional information are not interesting for you, you may skip installation of this plugin. Extract and copy plugin to the Wireshark plugin folder. If frames are not decoded with ZEPv3 go to menu Analyze -> Decode as -> ZEPv3 -> Apply, OK. Note: The procedure below describes how to adapt Wireshark columns to 802.15.4 frames. You may skip this section if you are satisfied with default settings. Wireshark is an extensive and powerful tool. We advise you to read its documentation page. It contains not only Wireshark itself but also several command line tools such editcap, mergecap, tshark, dumpcap etc. which might be useful where non trivial task are needed. You may continue to read about UWB Sniffer Configuration.